Sailors from USS Saipan rush out to unchain a CH-46 Sea Knight, April 2004. The Boeing CH-46 Sea Knight is a medium-lift tandem rotor cargo helicopter, used by the United States Marine Corps (USMC) to provide all-weather, day-or-night assault transport of combat troops, supplies and equipment. Assault Support is its primary function, and the movement of supplies and equipment is secondary. Additional tasks include combat support, search and rescue, support for forward refueling and rearming points, casualty evacuation and Tactical Recovery of Aircraft and Personnel (TRAP). The commercial version is the BV 107-II, commonly referred to as simply the "Vertol". Piasecki was a pioneering developer of tandem-rotor helicopters, with the most famous previous helicopter being the H-21 "Flying Banana". Piasecki's former company Vertol began work on a new tandem rotor helicopter designated the Vertol Model 107 or V-107 in 1957. The V-107 had two Lycoming T53 turboshaft engines, producing 860 shp (640 kW) each. The first flight of the V-107 took place on April 22, 1958. The V-107 was then put through a flight demonstration tour in the US and overseas. In June 1958, the US Army awarded a contract to Vertol for ten production aircraft designated "YHC-1A". A door gunner manning a pintle-mounted .50-caliber machine gun aboard a USMC CH-46. The order was later decreased to three, so the Army could divert funds to the V-114, a larger version of the V-107. The Army's three YHC-1As were powered by GE-T-58 engines. The YHC-1As first flew in August 1959, and were followed by an improved commercial/export model, the 107-II. During 1960, the U.S. Marine Corps (USMC) evolved a requirement for a twin-turbine troop/cargo assault helicopter to replace the piston engine types then in use. Following a design competition, Boeing Vertol was selected to build its model 107M as the HRB-1, early in 1961. Boeing had acquired Vertol in 1960 and renamed the group Boeing Vertol. The helicopter was first procured in 1961 to meet the medium-lift requirements of the Marine Corps. Its first flight in August 1962 was followed by a change in designation to CH-46A. Fleet introduction of CH-46As with the Marines and the Navy's UH-46As in November 1964. The UH-46A variant was modified for use in the vertical replenishment role. The CH-46A had tandem contrarotating rotors that were powered by two T58-GE8-8B turboshaft engines rated at 1,250 shp (930 kW) each. The engines were mounted on each side of the rear rotor pedestal with a driveshaft to the forward rotor. The engines were coupled so either could power both rotors in an emergency. The rotors featured three blades and could be folded for on ship operations. The CH-46A had a cargo bay with a rear loading ramp that could be removed or left open in flight for extended cargo or for parachute drops. A belly sling hook could be attached for carrying external cargo. It has a crew of three and could carry 17 passengers or 4,000 pounds (1,815 kg) of cargo. A pintle-mounted 0.50 in (12.7 mm) Browning machine gun was mounted on each side of the helicopter for self-defense. Service in southeast Asia resulted in the addition of armor with the guns. The CH-46A had fixed tricycle landing gear, with twin wheels on all three units. The gear configuration caused a nose-up stance to facilitate cargo loading and unloading. The main gear was fitted in rear sponsons that also contained fuel tanks with a total capacity of 350 US gallons (1,438 L). The USMC received 160 CH-46As and the US Navy acquired 24 UH-46As. US Marines from the 24th MEU prepare to board a CH-46. Approximately 350 CH-46D and CH-46F Sea Knights were converted to "E" models. These aircraft have improved avionics, hydraulics, drive train and upgraded 1770 shp (normal) and 1870 shp (military) T58-GE-16 and 16A engines, and are distinguished from earlier models by the square main engine exhausts. A total of 625 H-46s were produced for the United States Navy and Marine Corps with the final version being the CH-46E (although an F variant was procured before the E). The Dynamic Component Upgrade (DCU) incorporated starting in the mid-1990s provides for increased capabilities through strengthened drive systems and rotor controls. The commercial variant, the BV 107-II, was first ordered by New York Airways in 1960. They took delivery of their first three aircraft, configured for 25 passengers, in July 1962. 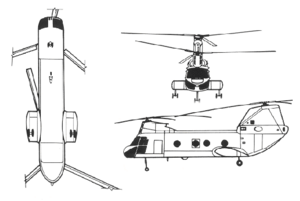 In 1965, Boeing Vertol sold the manufacturing rights of the 107 to Kawasaki Heavy Industries. Under this arrangement, all Model 107 civilian and military aircraft built in Japan are known as KV 107. On December 15, 2006, Columbia Helicopters, Inc acquired the type certificate for the Boeing Vertol 107-II, and is in the process of acquiring a Production Certificate from the FAA. Plans for actual production of the aircraft have not been announced. Known colloquially as the "Phrog", and used in all Marine combat and peacetime environments since its introduction, the last Sea Knight rolled off the assembly line in February 1971. Still regularly flown by the Marine Corps, its longevity as a reliable airframe has led to such mantras as "phrogs phorever" and "never trust a helicopter under 30." 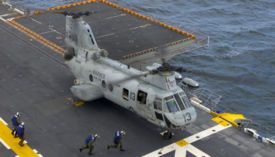 While the United States Navy retired the airframe on September 24, 2004 , replacing it with the MH-60S Knighthawk , the Marine Corps plans to maintain its fleet until the MV-22 is fully fielded. In March of 2006 Marine Medium Helicopter Squadron 263 (HMM-263) was deactivated and redesignated VMM-263 to serve as the first MV-22 squadron. The replacement process is expected to continue through the other medium helicopter squadrons into 2014. The Civilian version, the BV 107-II Vertol was developed prior to the military CH-46, and was operated commercially by New York Airways, Pan American World Airways and currently solely by Columbia Helicopters. 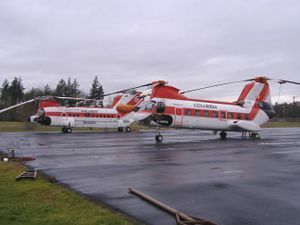 As of December 15, 2006 Columbia Helicopters has purchased the Type certificate of the Model 107 from Boeing. Currently the company is seeking FAA issuance of a Production Certificate to produce parts with eventual issuance of a PC to produce aircraft. Taken at the West 30th Street Heliport, New York Airways N6676D is hooked to a Ford Mustang for publicity stunt. The Mustang was flown around Manhattan by the BV 107-II. 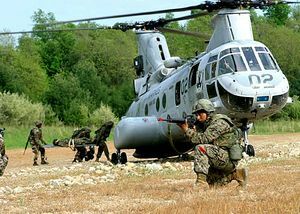 Marines load a simulated casualty onto a CH-46E while conducting convoy operations training at Camp Dawson, West Virginia. A UH-46D lowers mail to the fantail of USS Decatur. Total U.S. H-46 production amounted to 524, ending in 1971. The third YHC-1 prototype was converted into a commercial airline helicopter. All subsequent commercial aircraft were produced as BV 107-II. Military transport prototype for the United States Marine Corps. Three Model 107s for test and evaluation by the United States Army. Adopted by the United States Marine Corps as the HRB-1. Later redesignated YCH-46C. Three built. Assault, utility medium transport and SAR helicopter for the USMC, fitted with two 935-kW (1,250-shp) General Electric T58-GE-8 turboshaft engines. (Previously HRB-1). 164 built. Utility medium transport helicopter for the US Navy. Similar to the CH-46A. 14 built. A small number of HH-46As were converted into SAR helicopters for the United States Navy base rescue role. A small number of CH-46As were converted into minesweeping helicopters for the US Navy. Assault and utility medium transport helicopter for the USMC, fitted with two 1044-kW (1,400-shp) General Electric T58-GE-10 turboshaft engines. 266 built. A small number of UH-46Ds were converted into SAR helicopters. Utility transport helicopter for the US Navy combat supply role. Similar to the CH-46D. 10 built and one conversion from CH-46D. Approximately 350 -D and -F airframes were updated to CH-46E standards with improved avionics, hydraulics, drive train and upgraded T58-GE-16 engines. 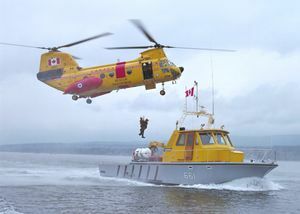 A CH-113 Labrador practicing an airlift from a Canadian Coast Guard cutter. A KV-107II from the film You Only Live Twice dropping the bad guys in Tokyo Bay. Improved version of the KV-107/II-2. Minesweeping version for the JMSDF, 3 built. Uprated version of the KV-107/II-3. Assault and utility transport version for the JGSDF. Uprated version of the KV-107/II-4. Long-range SAR version for the JASDF. Uprated version of the KV-107II-5A. HKP 4C for Swedish Navy. Powered by Rolls-Royce Gnome H.1200 turboshaft engines. Long-range transport version for the Tokyo Metropolitan Police Department, 1 built. Firefighting helicopter for Saudi Arabia. Aeromedical and rescue helicopter for Saudi Arabia. VIP transport helicopter for Saudi Arabia. Air ambulance helicopter for Saudi Arabia. ↑ Origins: Vertol V-107 & V-114, Vectorsite.net, July 1, 2004. ↑ 2.0 2.1 2.2 Spenser, Jay P. Whirlybirds, A History of the U.S. Helicopter Pioneers. University of Washington Press, 1998. ISBN 0-295-97699-3. ↑ 3.0 3.1 3.2 3.3 CH-46 history page, US Navy, 16 November 2000. ↑ CH-46 Sea Knight [H-49 "Phrog"]. Globalsecurity.org. ↑ 6.0 6.1 6.2 6.3 Boeing Sea Knight, Vectorsite.net, July 1, 2004. ↑ Boeing Vertol 107 - CH-46 Sea Knight. Helicopter History Site. Helis.com. ↑ Ask A Marine. HMM-364 Purple Foxy Ladies. ↑ Crawley, James W.. Swan song for Navy's ugly-duckling copter. SignonSanDiego.com. ↑ (2006). "Major Acquisition Programs - Aviation Combat Element Programs". Headquarters Marine Corps. ↑ White, LCpl Samuel. VMM-263 ready to write next chapter in Osprey program. U.S. Marine Corps. ↑ Type Certificate Data Sheet No. 1H16 (.pdf). Federal Aviation Administration (January 17,2007). Retrieved on Feb 8, 2007. CH-46E Sea Knight Helicopter. HQMC Fact File. U.S. Marine Corps. It uses material from the Wikipedia article "CH-46 Sea Knight". This page was last edited on 5 May 2008, at 23:08.